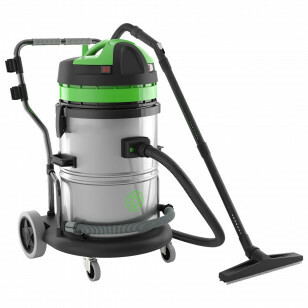 IPC Eagle has brought an industrially rated flood vacuum to the table at an economically affordable price. This model is the most affordable unit we have to offer from our full line of flood water extractors. It is such an industrial unit that we recommend it specifically for pumping out water from flooded basements and other water logged areas. At a pump out rate of 48 gallons per minute, this is the fastest flood water recovery vacuum that we have to offer. The only unit that we have that is close to that output is our water vacuum with pump out system. That model can pump out 30 gallons per minute, but can handle recovering solid objects like rocks and debris up to a 1/2" in diameter. This flooded basement water vacuum works great for flood recovery because of its large volume pump out capabilities. The vacuum comes with a fitting for a typical garden hose to hook up to it for the pumping out of the recovered fluids. There is a power switch for the vacuum, and a separate switch for the pump. This means that you can pump out while you recover, or recover, then move the vacuum to a suitable area and pump out. Obviously in flood recovery it would be best to be able to continuously recover and pump out without having to stop once the recovery tank fills up. With an 16 gallon tank, this can happen quite quickly. Accessory kit includes a 19 inch squeegee tool, 2 piece wand, & 10 foot hose. Can pump out up 48 gallons per minute of recovered flood water. Flooded basements can be pumped out in minutes. Powerful 1.5 HP vacuum motor powers the recovery side. .33 HP pump motor powers the dispensing side. Stainless steel can is easy to clean and will not rust or corrode over time. This is a review for the Flooded Basement Water Recovery Vacuum - 16 Gallon Steel Tank w/ Pump Out.